This spring I’m looking to switch things up a bit and get some fiction stories back in my life. I love a good fiction book. Getting sucked into an addictive fiction story is like a mini-vacation for me. So the first thing on my reading list is the Cormoran Strike series—a detective mystery series by “Robert Galbraith” (I only recently learned that J.K. Rowling had written the series under a pseudonym! And it’s been turned into a popular TV show in England? Sometimes you learn something that makes you feel like you were living under a rock.) I’m excited to dive into this series—there are three books out so far. I’ve also finally put Ready Player One by Ernest Cline on my list.vI’ve been meaning to read this for years and am feeling new motivation now that the movies is out.Catching up on my back catalog of YA novels, I’m also putting the Divergent series by Veronica Roth (I’ve never read them nor seen the movies). I have a fiend who has a strong love for post-apocalyptic YA novels and she raves about these books. Forever learning, I do still have non-fiction on my list. 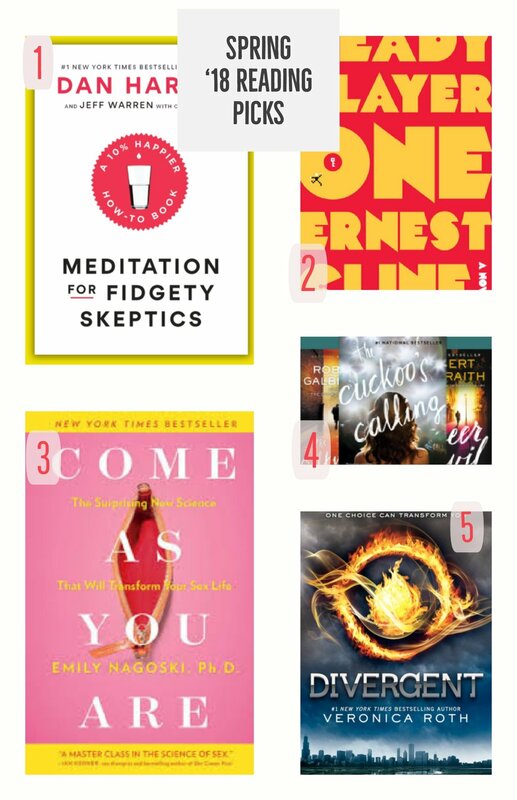 Meditation for Fidgety Skeptics by Dan Harris and Come As You Are by Dr. Emily Nagoski are top of my non-fiction list at the moment. I first tried getting into a meditation over a year ago when I moved back to the States. And oh am I a fidgety skeptic! My mom recently got me this book for my birthday. I think between this book, and giving audio guided meditation another go, I might have a chance at becoming a successful meditation convert. Dr. Nagoski is a Women’s Sexuality professor at Smith College and her book Come As You Are is something I wish it was in my life earlier. She specializes in human sexuality, relationships, and communications—things that could probably improve most adults lives. Have any books you’re looking forward to reading? Or read anything on my current list? I’m always looking for a good book recommendation. Leave your recommendations in the comments section (particularly if it’s a super enticing piece of fiction or a graphic novel—I’ve been looking for a few suggestions in that area to read). Likewise, if you’ve read any of the books on my Spring Reading List, let me know what you thought of them!